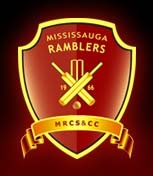 The Mississauga Ramblers Cricket, Sports & Cultural Club was formed in 1966 with the aim of promoting the game of cricket specifically at the grassroots level, other sports, healthy lifestyle, and cultural activities in the community in a professional, respectful and responsible manner. A strong contender for the T20 Prize Money, Ramblers will have enough fire power with players who represented Canadian National teams. Ramblers will plan …rock the Niagara Cricket Festival -2013 with some real fireworks.